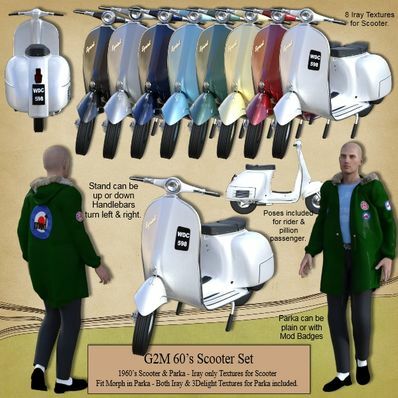 60's Scooter Set for Genesis 2 Male for use in Daz Studio 4.8. The scooter is not authentic, it is just a copy taken from a photo of my Husband's '60's Vespa. Fit Morph in Parka included. Set parka to collide with clothing item below. Scooter can have stand up or down. Handlebars turn left & right. 2 base Poses included for rider and pillion passenger. I have also included several Textures - Iray textures only for Scooter - both Iray & 3Delight for Parka. Than you! Reminds me of the ole dayz travelling to Brighton. Great work. Wow, I had not noticed this scooter, just what I needed! Thanks! these and the cycling out are so cool. you do great work. Wow! Fantastic work. Also for the Vespa! Thank you so much, Wendy! Kool, no more walking, thank you! Wendy, thank you - a great scooter!! What an absolute delight. This is an amazing scooter. Thank you so much! Love the various colors and the parka!! Amazing work Wilmap!!! Thanks so much! The textures are all Iray so I don't understand why you added an Iray surface finish? to it. This scooter is really nice and looks great. I applied Iray surface finish in DAZ 3D 4.8 and it is really convincing. Thanks Wilmap! super cool set, thanks so much! Many, many thanks for this GREAT set!!! What a fabulous set, many thanks! Lovely, I can't wait to put this in a scene, thank you! I've just downloaded the file with no problems. Can you try again?